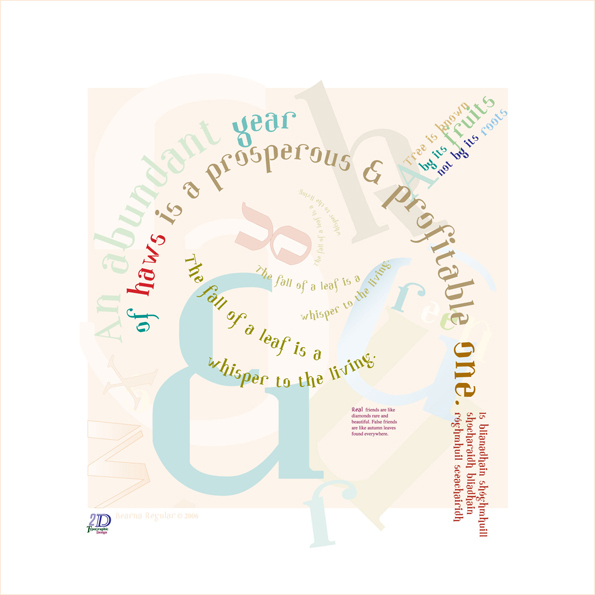 The proverbs and colours chosen for use in these pieces are seasonal. 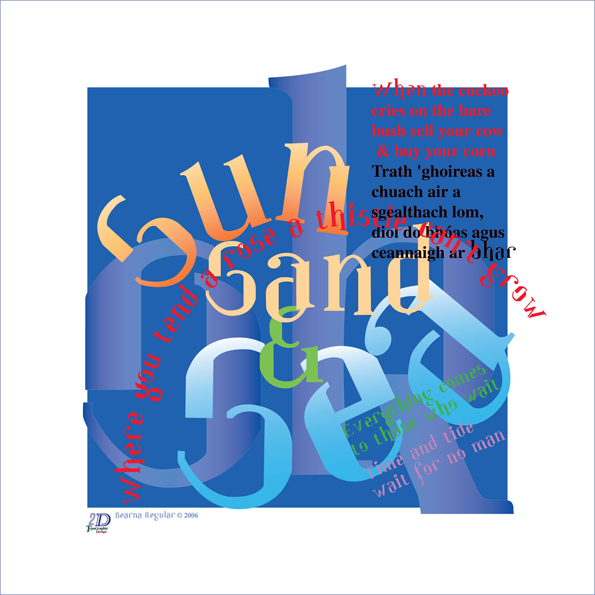 This combination of my typeface Bearna, colours and proverbs brings you a unique wall piece.The first four pieces represent the four seasons; Autumn, Summer, Spring and Winter. 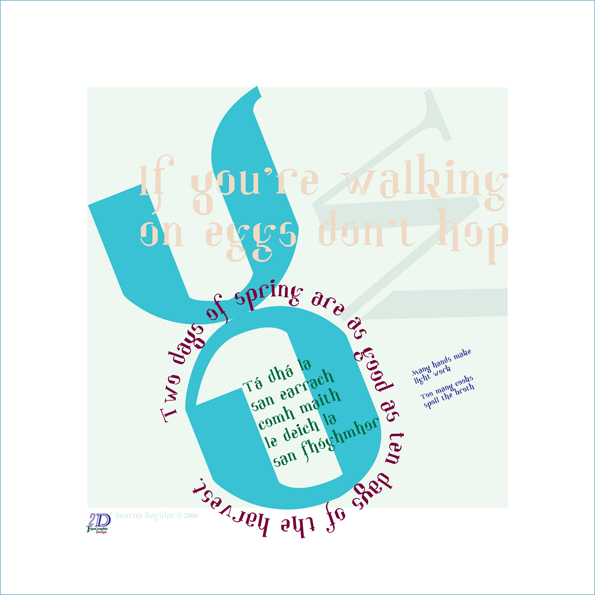 In these pieces I utilise old Irish proverbs that have relevance to the seasons they depict. Winter tells us ‘The year is but a quick succession of brief moments’. 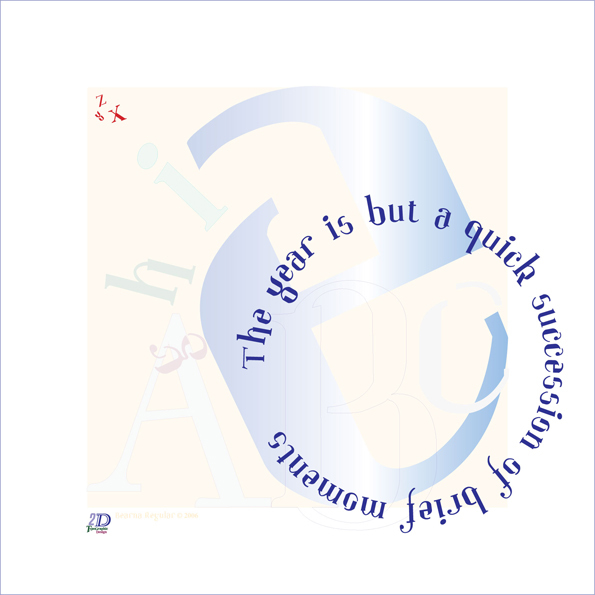 While letters swirl like snowflakes reflecting the cool colours of winter skies. Two days of Spring are as good as ten days of the harvest’ Tá dhá la san earrach comh maith le deich la san fhóghmhor. Spring rejuvenates, it is a time of growth & renewal. To-day in advertising we commonly use symbols of eggs & hopping bunnies or chicks to portray Spring. ‘Many hands make light work’ as we sow the seeds for the harvest later in the year. Injecting a little humour, we must temper our enthusiasm a little as ‘Too many cooks spoil the broth’. Sun, Sand & Sea the ingredients for a wonderful Summer hoilday. Al sorts of creature, human, avian, fauna migrate.’ When the Cuckoo cries on the bare bush sell your cow & buy your corn’. Trath ‘ghoireas a chuach air a sgealthach lom, dhoil do bhóas agus ceannaigh ar bhar. When the cuckoo calls early there will be an early harvest, indeed a skilled farmer will cut more than one crop of silage from the field. ‘Everything comes to those who wait’. That said ‘Time & tide wait for no man’. Look after yourself, those around you & that which you care for, ‘Where you tend a rose a thistle cant grow’ and life will be good. Autumn is a time of plenty and industry. ‘An abundant year of haws is a prosperous & profitable one’, ‘Is bliadhain shóghmhuil shocharaidh bliadhain róghmhuil sceachairidh‘ Trees heavy with fruit suggests the harvested crops are also plentiful. ‘The fall of a leaf is a whisper to the living’. The cycle of life, the tree sheds its leaves to prepare to sleep over winter. ‘A tree is known by its fruits not it’s roots’. It is by our achievements and accomplishments in life is how we will be remembered ‘Real friends are like diamonds rare & beautiful. False friends are like autumn leaves found everywhere’. This is a plain truth.